Columba was an Irish monk and priest–in his own language his baptismal name is Columcille, “dove of the church.” After some years of study and service, he left Ireland. Some legends say that he had caused a battle, and he was asked to go. Earlier chronicles suggest he simply heard God’s call to share the good news with those who had never heard. For whatever reason, in the year 563 Columba set sail. Voyaging until his homeland was out of sight, he founded a monastery on the rocky island of Iona, off the Scottish coast. There at Iona, Columba and his companions formed a community of worship and prayer, singing Psalms, studying Scripture, and drawing many to join them. The great saint traveled widely, preaching and working miracles. He influenced and counseled kings, composed hymns, established numerous monasteries and churches, and led many to believe in the Lord Jesus and be baptized. Columba died in 597, but his influence lived on. The monks of Iona journeyed to every corner of Scotland and beyond, carrying the message of new life and transformation through the death and resurrection of Jesus Christ. And the legacy continues. Like those Christians at Iona, Saint Columba Church is a community of worship and prayer, dedicated to the Lord Jesus and to one another. We have heard God’s call. And we too are on mission, serving those around us, bringing the good news of Jesus to our friends, neighbors, and everyone we meet. The feast of Saint Columba is June 9th. 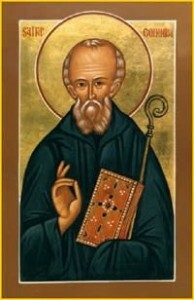 To learn more, read The Life of Saint Columba by Adamnan, ninth abbot of Iona.